D'angelico, Stromberg, Kay, Hofner vintage guitars history and collecting. Private vintage guitar collector. Pictures, history for other makes of vintage guitars. Contact the Vintage Guitar Info Guy. There are lots of other cool makes of instruments out there. But these are the "big" ones that I have some information on. Note the Hofner section has been greatly updated and moved to its own section, and removed from here. Kay primarily manufactured "department store" style, inexpensive guitars from the 1930's to the 1960's. But they also made some hi-end, quality archtop guitars. The most collectable Kays are any model with the "Kelvinator" plastic headstock overlay with art deco patterns. Used from 1957 to 1960, this headstock was named after the brand of refrigerator that looked quite similar. This overlay was injection molded with clear acrylic plastic and then back-painted either white or black, with gold highlights in the crest and gold dots outside of the crest. Starting in late 1960, Kay switched to a less expensive "half" Kelvinator that used just the triangle Kay crest from the full Kelvinator, screwed to a simple black plastic headstock veneer. This "half" Kelvinator dropped the black or white back-painted acyrlic "lunchcountertop" surround with gold dots. This design only lasted till the end of 1961 when the Kelvinator headstock was completely dropped. Note that Kay also made guitar with other brand names on the headstock. These are still Kay's, just they are made for department store type companies. This includes Spiegel ("Old Kraftsmen"), Montgomery Ward ("Sherwood Deluxe"), Sears and Roebuck ("Silvertone"), and Orpheum through the 1950's and 1960's. The most common name (other than "Kay") is by far "Old Kraftsmen". Kays are notorious for having bad neck sets and broken truss rod systems. Usually, this can be corrected by a good repair person for around $150 to $200. Single cutaway archtop, 13" wide, veneer maple body, spruce top, no F-holes, 1 or 2 single coil "Gold K" pickups, block fingerboard inlays starting at the 3rd fret, "Kelvinator" peghead, "Barney Kessel" signature on the silver colored acrylic pickguard, chrome open back Grover tuners, rosewood bridge, sunburst or blond finish. Available 1957 to 1961. In 1960, Barney Kessel's signature was removed from the pickguard. Single cutaway archtop, 15 1/2" wide, veneer maple body, spruce top, bound F-holes, 1 or 2 single coil "Gold K" pickups, block fingerboard inlays starting at the 1st fret, rosewood fingerboard, "Barney Kessel" signature on the silver colored acrylic pickguard, "Kelvinator" peghead, chrome Melita bridge, nickel Grover tuners, sunburst or blond finish. Available 1957 to 1961. In 1960, Barney Kessel's signature was removed from the pickguard. Completed with the Gibson L-5CES. Single cutaway archtop, 17" wide, veneer maple body, spruce top, bound F-holes, 1 or 2 single coil "Gold K" pickups, split-block fingerboard inlays, ebony fingerboard, "Barney Kessel" signature on the silver colored acrylic pickguard, "Kelvinator" peghead, chrome Melita bridge, chrome Grover Imperial tuners, sunburst or blond finish. Available 1957 to 1961. In 1960, Barney Kessel's signature was removed from the pickguard. Kay's less expensive alternative to the Barney Kessel Jazz Special. Single cutaway archtop, 17" wide, veneer maple body, rosewood fingerboard with pearloid block inlays starting at the 3rd fret, rosewood bridge, closed back individual Kluson tuners with metal buttons, large scalloped pickguard sometimes with silver sparkle, sunburst, blond or black finish. Available with 1 or 2 "Gold K" single coil pickup from 1957 to 1959. In late 1959, 3 pickup "ES-5" type model available. Made from 1957 to 1961. Full Kelvinator headstock from 1957 to 1960, half Kelvinator headstock in 1961. 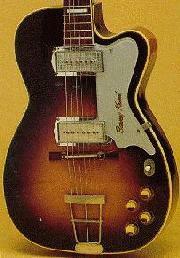 K-161 ThinTwin (Jimmy Reed or Howlin' Wolf model). 15" wide, single cutaway, flat top semi-hollow maple body, blond top and sunburst back and sides, 1 or 2 blade pickups, block fingerboard inlays starting at the 3rd fret, rosewood fingerboard, trapeze tailpiece, rosewood bridge fixed to top. Available 1952 to 1960. Tortoise shell pickguard from 1952 to 1957, black pickguard from 1958 to 1960. 15 1/4" wide, double cutaway fully hollow 2" thick veneer maple body (like an ES-330), rosewood fingerboard with "shark fin" inlays starting at the 3rd fret, two "Gold K" single coil pickups, bolt-on maple neck, Bigsby vibrato and aluminum bridge, silver painted scalloped acrylic pickguard, half Kelvinator headstock, nickel Grover tuners, bound top, back and fingerboard, blond or sunburst finish. Available 1961 to ?. Completed with the Gibson L-7C, Single custaway acoustic archtop, 17" wide veneer maple body, spruce top, rosewood fingerboard, block or "shark fin" fingerboard inlays starting at the 3rd fret, large scalloped pickguard, closed back individual Kluson tuners with metal buttons, trapeze tailpiece, blond or sunburst finish. Available 1953 to 1959. Starting in 1958 came with a full Kelvinator headstock. Completed with the Gibson L-5C. Single cutaway acoustic archtop, 17" wide, veneer maple body, spruce top, ebony fingerboard, split-block fingerboard inlays, scalloped fingerboard extension, ebony bridge, Kluson sealfast tuners, ES-300 style trapeze tailpiece, large scalloped pickguard, blond or sunburst finish. Available 1953 to 1959. Starting in 1958 came with full Kelvinator headstock. Same size as a Gibson J-200. 17" wide veneer maple body, spruce top with X-bracing, ebony fingerboard, pearl block inlays starting at the 1st fret, small screwed-on pickguard, belly bridge. Available 1952 to 1963. Starting in 1958 came with a full Kelvinator headstock. By 1961, a half Kalventor headstock was used. Same size as a Gibson J-200. 17" wide veneer maple body, spruce top with X-bracing, rosewood fingerboard, pearloid block inlays starting at the 3rd fret, small screwed-on pickguard, rectangle bridge. Available 1952 to 1963. Starting in 1958 came with a full Kelvinator headstock. By 1961, a half Kalventor headstock was used. Same size as a Gibson J-200. 17" wide mahogany body, spruce top with ladder bracing, rosewood fingerboard, pearloid block inlays starting at the 3rd fret, small screwed-on pickguard, rectangle bridge. Available 1952 to 1963. Fingerboard inlays changed to "double parallelagrams" in 1955. Same size as a Gibson J-200. 17" wide veneer maple body with cutaway, spruce top with X-bracing, rosewood fingerboard, pearloid block inlays starting at the 3rd fret, small screwed-on pickguard, belly bridge. Available 1955 to 1959. I do *not* collect Harmony guitars, and frankly don't know a lot about them. But I get constant questions on them. This is all I know, so please do not email me with any Harmony questions. Harmony was THE department store guitar until the early 1970s for cheap flat top and arch top guitars. Usually the stores would re-brand the guitar to their store guitar name (like Silvertone or Catalina, etc.) But I am constantly asked when they are made. Inside there are usually some ink-stamped numbers, as seen in the picture below. In this picture, the dark numbers (0129H929) represent the Harmony guitar model. In this case model Harmony ("H") H929. The light blue number (f-70) represents Fall 1970, which was when this guitar was made. Harmony used this type of markings from the 1950s to the 1970s. made in the Fall of 1970 (F-70). See the new and updated Hofner section by clicking here. Players and collectors consider D'Angelico Excel and New Yorker models to be amoung the finest archtop guitars ever made. They are extremely collectable. Note that John D'Angelico died in 1964, and his apprentice D'Aquisto finished his last few models that were "work in progress". Serial Numbers 1932 to 1964. D'Angelico serial numbers are not strictly chronological. Some overlaps in date ranges occur. 16 5/8" wide, parallel bracing, unbound F-holes, smooth edge pickguard, block inlay (some early examples with dot inlays), rounded peak and 2 small points on top of peghead (some with no points). Available 1936 to 1945. 16 5/8" wide, parallel bracing (possibly a few with "X" bracing after WWII), unbound F-holes, peghead with broken-scroll pediment framing ornamental cupola (button), pointed angels on scroll. Available 1936 to 1948. Available in late 1934, the first Excels were 16 5/8" wide, had "straight" f-holes, and engraved fingerboard inlays. Then in late 1937 the body changed to 17" wide and curved single bound f-holes. All models have multiple bound top and back, block inlays, peghead with broken scroll pediment framing ornamental cupola (button), rounded angles on scroll, and in 1943 stairstep tailpiece. It is thought that he started using "X" bracing just after WWII. Available 1934 to 1964. 18" wide, X-braced top, triple bound F-holes, black binding lines on body sides and side of fingerboard, split-block fingerboard inlays, gold plated parts, skyscraper peghead logo. Some examples with peghead with broken scroll pediment framing ornamental cupola (button) and rounded angles on scroll). Available 1936 to 1964. 17" wide, New Yorker trimmed Excel. Available 1943 to 1964. 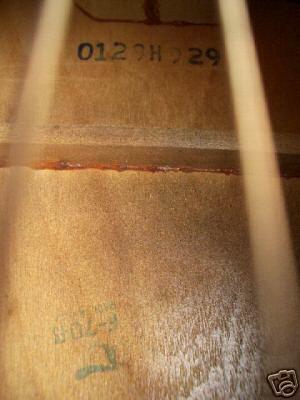 Stromberg's workmanship is generally considered amoung the best, though not quite as good as D'Angelico archtops. Stromberg's late model guitars from the 1950's have great sound that makes them quite collectable. The early models with multiple top braces do not sound as good, but are collectable because of the Stromberg's reputation. tailpiece with 2 horizontal plates and 4 vertical tubes, triple bound top and back, bound pickguard, notched-diamond or 4-point fingerboard inlays, bound peghead, nickel plated parts. 17 3/8" wide, bound pickguard with straight edges, ebony fingerboard, slashed-block fingerboard inlays, gold plated parts, natural or sunburst finish. 17 3/8" wide, tailpiece with 3 cutouts and Y-shaped center section, bound pickguard with stairstep treble side, bound F-holes, bound ebony fingerboard with pointed end, "Deluxe" on peghead, natural or sunburst finish, gold plated parts. 19" wide, bound stairstep pickguard, block inlay. 19" wide, heavy tailpiece with 5 cutouts, bound pickguard with stairstep treble side, bound F-holes, pointed end ebony fingerboard with slashed-block inlays, celluloid peghead veneer with "400" engraved, gold plated parts, sunburst or natural finish. Cutaway models very rare. D'angelico, Stromberg, Kay, Hofner vintage guitars history and collecting. vintage guitars collecting info. Private vintage guitar collector. Pictures, history for vintage fender gibson martin epiphone national dobro gretsch rickenbacker danelectro kay dangelico stromberg guitars.